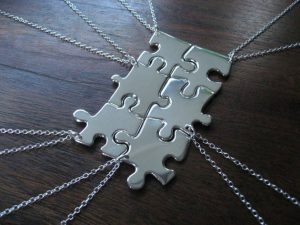 If you have a collection of necklaces made from a variety of upcycled stuff, add another to your kitty by making an enticing one with your kiddo’s old jigsaw puzzle set that he uses no more. 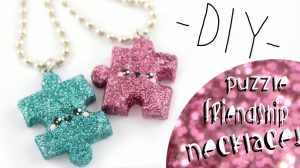 Let us take a quick glimpse at a host of various tutorials to get an idea of making some beautiful puzzle piece necklaces. 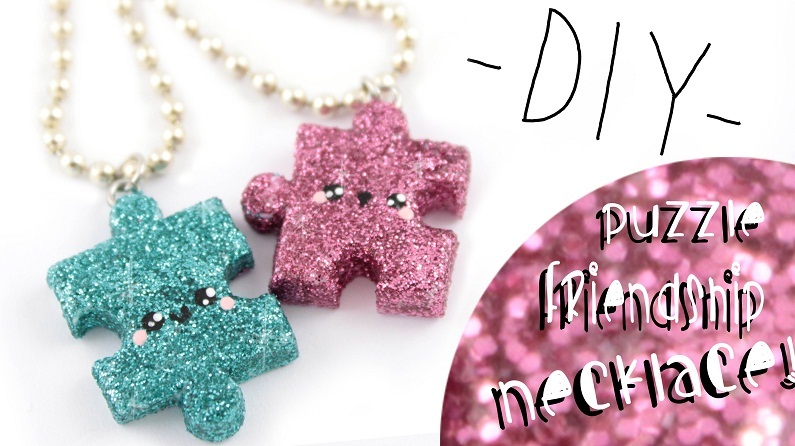 Giving your pals a puzzle piece necklace each on Friendship Day would brighten their mood to the fullest. 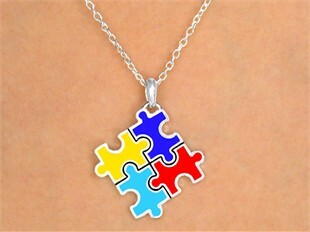 If you are a group of four, then make a puzzle piece necklace like the one shown in the picture below. You can make necklaces with six, eight, ten or even more puzzle pieces in case you have a bigger family. 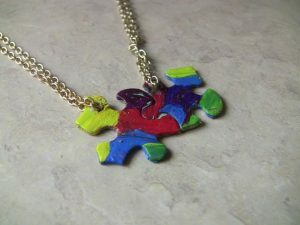 The complex arrangement of puzzles makes it have a unique relation to autism. If you have or are acquainted with autistic kids, then make a necklace for each one of them using four or five puzzle pieces confining to the main colors associated with autism—red, blue and yellow, just like the one shown in the picture below. 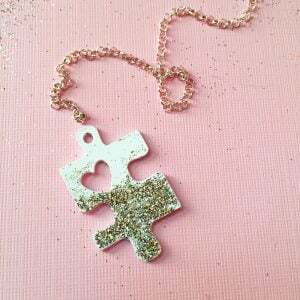 You may even buy puzzle pendants of the same color in case you do not want to go through the tedious task of spray painting it. 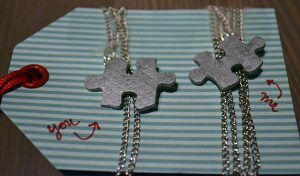 If you want your best friend to have the same kind of necklace, then make two similar sets. 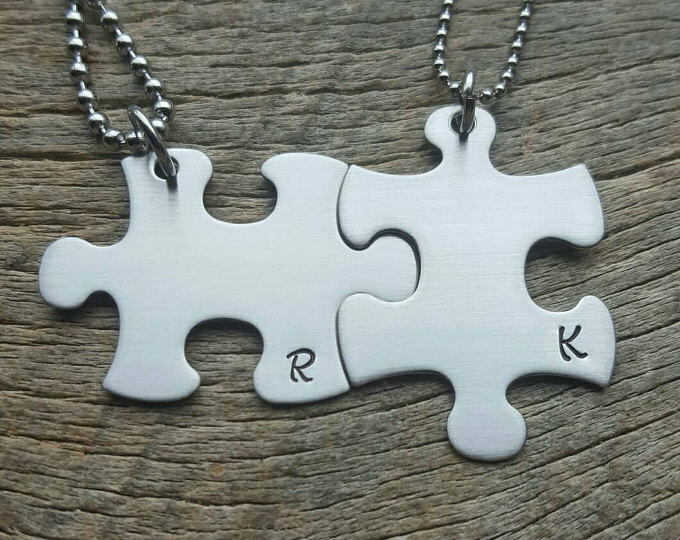 You may even paint the initials of both of your names for a personalized look. 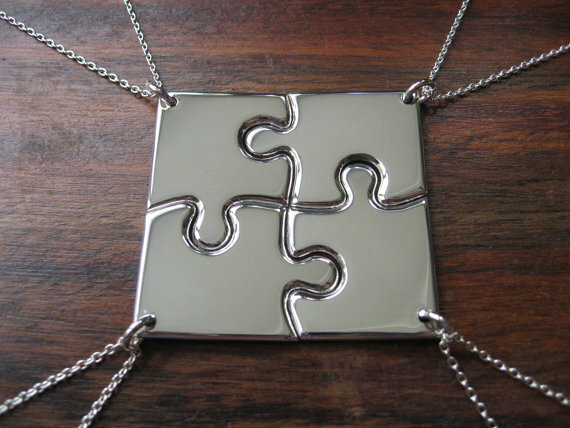 If you are planning to make it as a birthday gift, consider embellishing your necklace with jewels resembling the birthstone color of the person you are presenting it to, just like the one shown in the image below. You can buy a gold puzzle pendant or make an elegant neckpiece by applying gold spray paint on your puzzle piece. 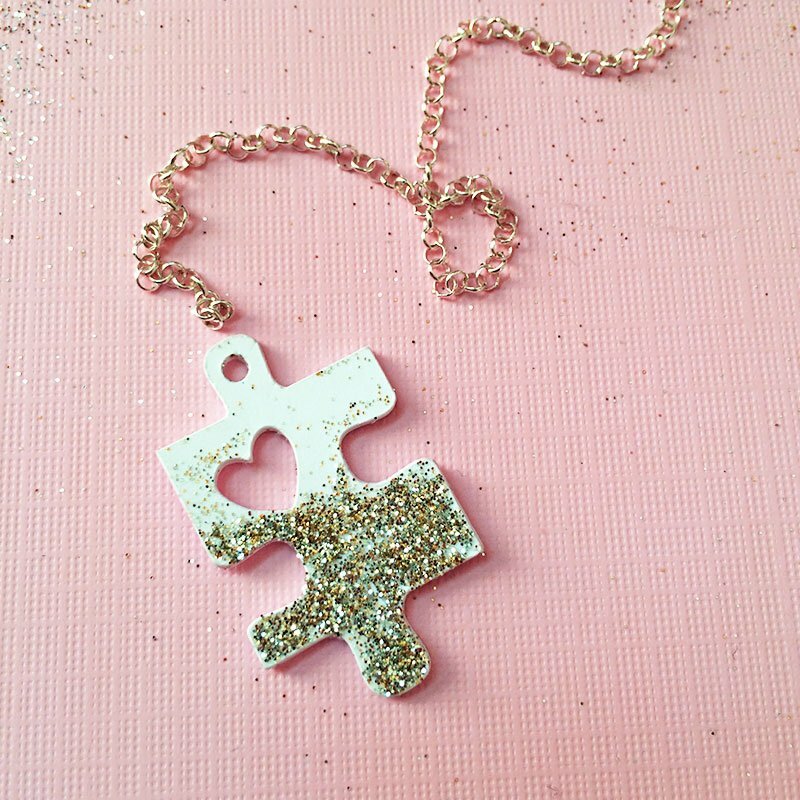 The glitters add charm to the puzzle piece necklace. 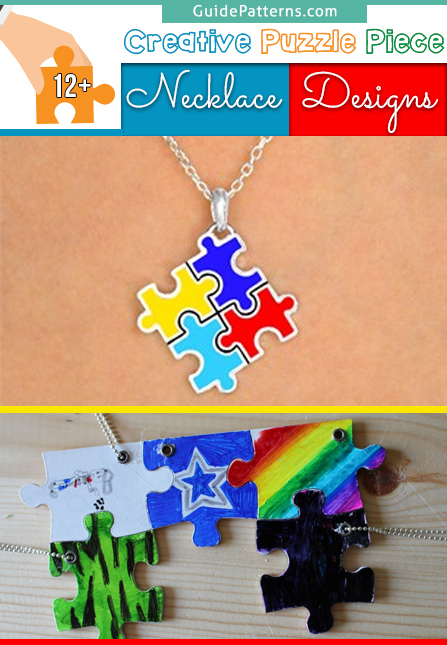 Your kiddo would be delighted to make these colorful accessories from her jigsaw puzzles for her best pals. By following the instructions in the given tutorial, you can design a lovely puzzle piece necklace like the one seen in the picture for you and your beau. If your wedding bells are ringing, then you may also arrange a special surprise for your bridesmaids by making puzzle piece necklaces for all of them, with their initials embossed on it. 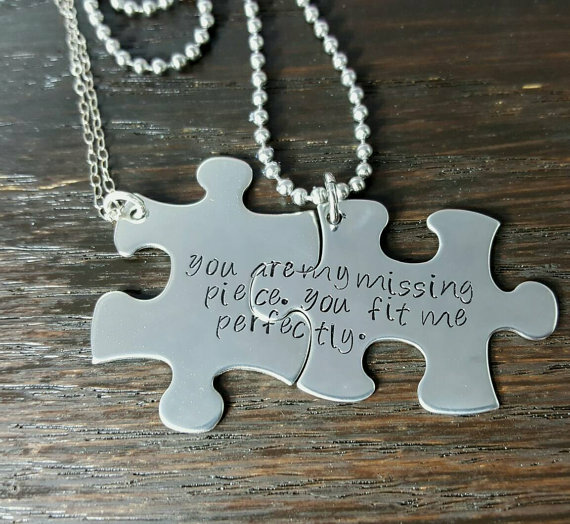 By using the metal stamps, you can also engrave any other personalized message of your choice like “You and me”; “You complete me” and so on, just like the one shown in the picture. You can set them in a lovely box where they would appear interlocked, after which one part would be with you and the other with your partner. 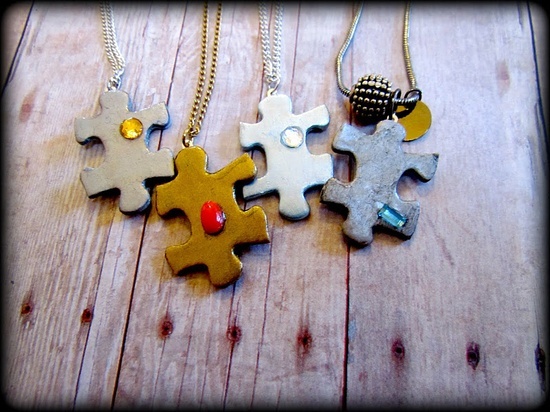 The missing heart in the middle connecting the two necklaces would indeed be a unique way to display your affection towards your loved ones. 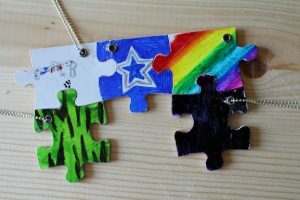 The above tutorial shows us the way for making a keychain using two puzzle pieces. 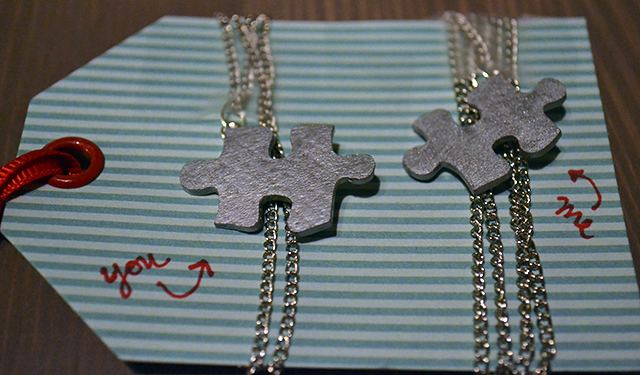 Follow the same directions to make a necklace, the only exception being the addition of a chain to the jump ring. You can even use this concept to create a Mother’s Day or Friendship Day necklace where the photo would be of the mother and daughter or two pals. 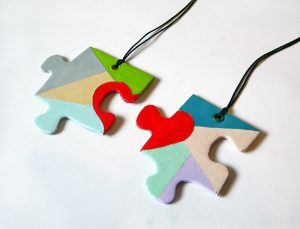 You can shape polymer clay into puzzles and paint them in a color of your choice in case you do not have the real ones. 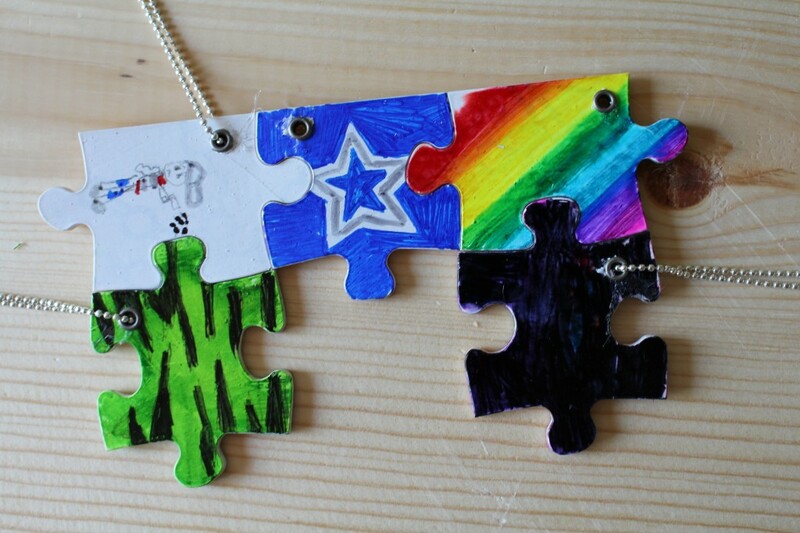 Another way to make faux puzzles is by tracing out puzzle pieces image on a shrink dink and finally baking them. 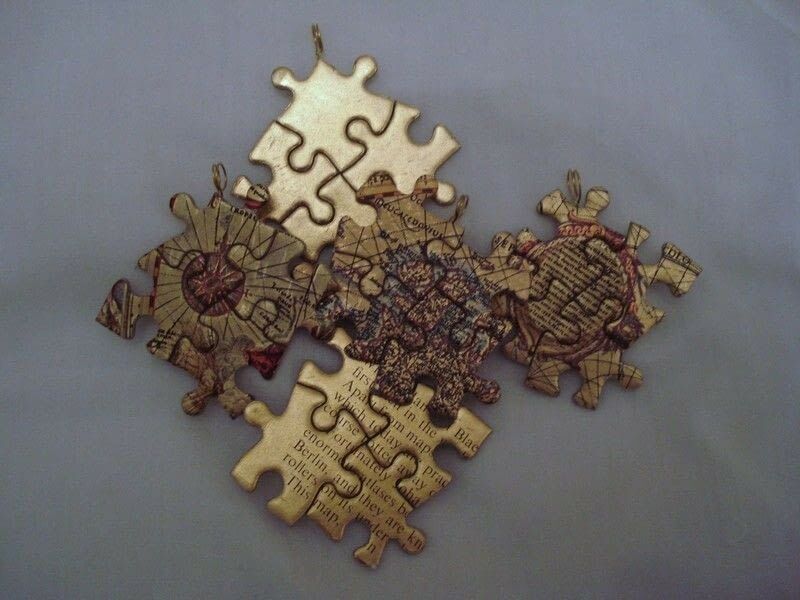 Whether you make it from a jigsaw puzzle, paint it in gold, silver or any other color of your choice and shape them into a heart or any other attractive design, the choice is yours. 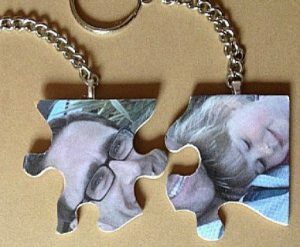 Make a variety of them for your loved ones to gift them on several occasions.